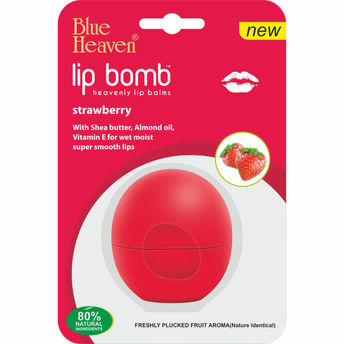 Blue Heaven Lip Bomb comes with 80% Natural ingredients and freshly plucked with Fruits Aroma (Natural Identical) It Nourishes, moisturizes, Protects and heals your chapped n dry lips. Enriched with Canola oil which gives protection of skin proteins and lipids against photo oxidation and free radicals while Shea butter helps in moisturisation and skin barrier recovery. Easy to handle and carry around, you can just prop this in the side-zipper of your handbag or your vanity kit for easy access. The lip balm can easily glide along your lips to give that smooth and moisture intense feel. It is packed with Shea Butter and Canola Oil, therefore keeping your lips moist and soft. The lip balm container comes in the form of a sphere which has a twist-off top for easy usage. Easy to handle and carry around. Explore the entire range of Lip Balm available on Nykaa. Shop more Blue Heaven products here.You can browse through the complete world of Blue Heaven Lip Balm .